part 2 - in the paper - film of the journey! 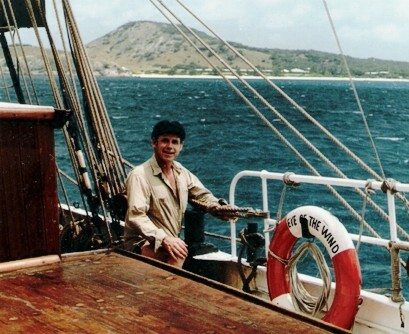 As a child living in Norway, I was fascinated listening to my father telling me stories of his experiences while sailing on square-rigged ships. 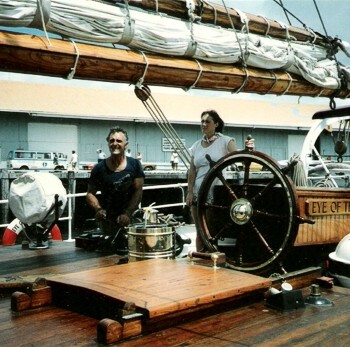 My interest in the brigantine Eye of the Wind began in the spring of 1984 while I was sailing in Australian waters on another brigantine named Golden Plover. Upon my return home to Seattle, Washington USA, I spent the next many months trying to locate the owners of the EOW. As soon as the owners were located, everything went smoothly. I and two friends, Dolores Moore and Loren Fiske, made arrangements to sign on as part of the guest-crew on the EOW in November of 1985. 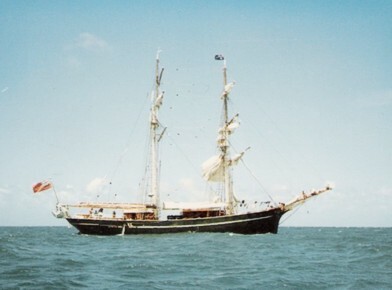 We were to join the ship in Cairns, Australia for one leg of its voyage to Hong Kong where it was to be part of the movie production of the film "Taipan". 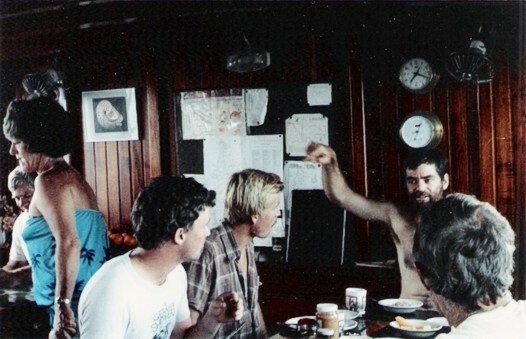 With all onboard, the crew and guest-crew assembled in the galley where we were introduced to our skipper, Tiger Timbs. We toasted with champagne, got acquainted with each other and received our sea watch assignments. 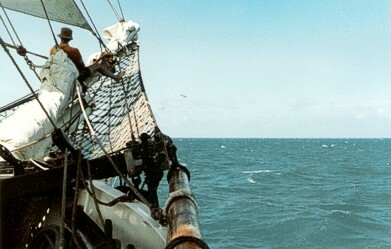 A few hours later, with the sails billowing in the wind, our adventure began. For the crew, it was work as usual but for the guest-crew, it was a dream come true. Our first stop was Cooktown. We dropped anchor at the entrance to the Endeavour River and used one of the ship's inflatable boats to ferry us to the beach. 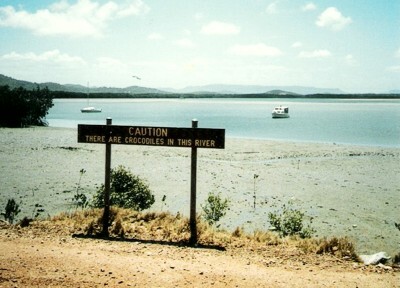 Cooktown was an interesting village full of Gold Fever history, but the town was named after Capt. James Cook. It was here in 1770 that he beached his ship the HMS Endeavour to make repairs after it collided with a coral reef nearby and began to sink. There was a very interesting maritime museum in Cooktown with one section of the museum dedicated to Capt. Cook and his stay there. The other section was dedicated to life on the Great Barrier Reef and its many land and sea inhabitants. Our museum guide told us that the river is full of crocodiles and explained that when they fight, they try to bite and damage the nose of the others. The injured crocodiles being severely handicapped in the water, now the only food source available is on land which makes them very dangerous. Even Capt. Cook wrote of some of these dangers in his journals. For us, the beautiful atmosphere of the tropical South Seas now takes on a more serious note. 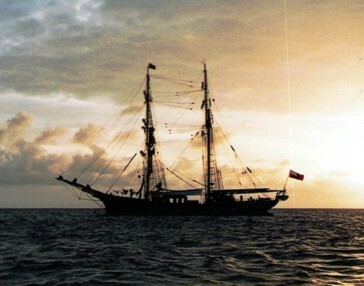 At sunset, we pulled anchor and set sail for Lizard Island and arrived at daybreak. Lizard Island is home to a very upscale resort. Apart from the main lodge, there were 30 or more cabins and its own air strip. Activities available included tennis, wind surfing, snorkeling and swimming, but one of the main attractions was deep sea fishing for which the resort is famous. One of the guest-crew, Bob, who is also a marine pilot, encouraged us and walked us over to the other side of the island for a visit to the Lizard Island Marine Observatory. We saw many 2 to 3 foot long lizards on the way, some hiding in the bushes but most of them just ran away. At the observatory we first saw a slide show put on by the Australian Conservation Department. Then we viewed several large seawater tanks filled with coral, starfish, turtles, huge clams and a large shell collection. Again, we saw the poison cone shell that we learned of at the maritime museum in Cooktown. The mollusks in these cone shells have harpoons attached to a poison gland. They hunt by shooting the harpoon into a living prey and paralyzing it immediately which is fatal. We were also made aware that each year a few people fall prey to cone shell poisonings in Australia. As we headed back to the EOW, we saw a power boat by the dock and a medic with a wooden first-aid box running to the resort. As we passed the main building at the resort, we saw a man lying on the floor with people checking his legs and another man on the telephone with the hospital getting instructions. It appears that he might have been stung by a venomous jellyfish. This is a very interesting and rugged place. As we near the ship, we are greeted with the delicious scent of lasagna for dinner. Then there was happy hour - rum, beer or tea in the lower salon where we played some recorded tapes that we bought in Cairns about the "Fateful Wedding" as well as our homemade tape of the overdressed piano player at the Hides Hotel who was playing and singing "Waltzing Matilda". We all had a good time and laughed a lot. 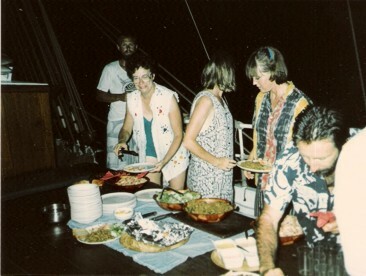 After dinner, some went back to the Lizard Island Lodge lounge while the rest stayed on board and swapped stories. As we departed Lizard Island early the next morning to explore parts of the Great Barrier Reef, we sailed by the island's highest point, Cook's Look. It was named after Capt. Cook as he climbed to the top hoping to see and find a way out to open water. To strike another coral reef now would mean the end for him and the expedition. The sea around the coral reef at Cook's opening was calm and a decision was made to dive and explore the area for fish and coral. For those of us who were not certified scuba divers, there was snorkeling gear and a box with a viewing window. The undersea beauty was virtually indescribable with multicolored coral, little yellow fish darting in and around all sorts of fish, big, little and everything in between that you would expect to see in a tropical aquarium. What a majestic sight. It made one feel very unimportant in nature's scheme. We were awed by all of this. Then, back to the ship again for lunch and tea. Off again, this time to feed giant, tame cod fish for which the area is known. A large cabin cruiser had also arrived. We expected the fish to jump out of the water and to take the food out of our hands, but there was no action. Leslie and Wendy dived in for a look around. They spotted a few cod but the fish seemed leery. Something was wrong. As we got nearer to the cabin cruiser, the men on the stern started to pull in their line. The line had a hook and they had hooked some coral. Lois from the Marine Biology Lab was irate and called the skipper by his name. She then gave him a verbal bashing. We took pictures of his boat, as well as the boat's name and number. The cabin cruiser's skipper was reminded that this was a protected marine park and told that we were sending in a report to the authorities about this incident. We headed back to Lizard Island for an evening barbeque on one of the island's many beautiful sandy beaches.